So here’s some of the thinking behind the Tuttle Club idea. I’ve talked mostly about what it should be, to help people understand, but there are actually some important things to say about *why*, which really help me see what is important to keep in and what things can go by the wayside. Once upon a time all there was was offline – so much so that we didn’t think about it, we just walked over the street and talked to people. And they took our lunch money and told us to bugger off. Sometimes we built more positive relationships too. I think it’s odd that we have to remind ourselves that this was the case but we do, increasingly, especially as time goes by and more and more people come into the world who’ve never known anything different – you know, people who were *born* in the 80’s – weird. Then we moved into a kind of binary place where you were either one or the other – from 9600 to 14.4k to 8MB broadband, for lots of people you’re still either online or offline and online means being sitting at a computer. However increasingly it’s whatever (and wherever) works. The boundary is blurring and we can see a time when we’ll be always on, which means that on is as meaningless as off used to be, the distinction may disappear. 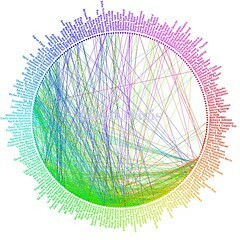 A quick reminder – what we’re talking about is ways of people connecting with each other. When I first got an internet connection pre web, there were three things pretty much that you’d want to do. Email, Usenet News and MUD (Multi-user Dungeon) – ways of finding things like gopher, veronica and archie were ways of finding people who’d created cool stuff as much as finding the cool stuff itself. I never was much of a gamer, so I was attracted to reading and writing and getting to know people through usenet and e-mail. Now Web 2.0 is supposedly doing something new, but it’s simply giving people more sophisticated ways of doing what we’ve always been doing on the net. So I’m asking whether there’s any real difference between online relationships and those we do offline, whether you draw the distinction between based on where they started, or where most transactions currently take place. And the answer seems to me, to be no, there isn’t any significant difference, what is more important is that relationships can be enhanced by interaction online and off- and that these different types of interactions build a deeper, stronger sort of relationship than those that only happen in one “place”. I have more and more of these relationships, people who once I would only ever have read or read about, I see face to face and we get to know each other better and then our relationship online is even stronger. My “friendship” group then (and put on one side the question of the definitions of “friend”) gets bigger and more diverse and so the question of the Dunbar’s number comes up – 150? WTF? I have more than 300 facebook friends and for every one of them, I can think of a little circle of others who aren’t there, or whom I’ve not yet linked to. The Facebook friend wheel shines a bit of light on this. I can see the little communities, constituencies, compartments that hold people together in the way they are grouped around the wheel. This is how we’ve managed the transition between the pre-industrial world of only being able to meet at most a hundred or so people in your life to where we are now where potentially you can have some contact with hundreds of thousands. We compartmentalise. These are my friends in my team. These are people I go to the pub with. These are my “friends” in Accounts Payable. These are the people I know who are into ska. These are my golf friends. (This is the me-focused way of looking at the fact that I belong to multiple communities as JP’s talking about this morning). This reduces the cognitive load – if we’re only really comfortable with up to 150 people but we have to deal with more, then we can handle it by divide and conquer – we only have to deal with a smaller number at any one time. Before social software we all knew the potential stress of having members of more than one group meet up with each other (that’s one reason why weddings can break people). Before this point we could get away with being different people in different situations and to a certain extent be dishonest with some groups of people about who we are or who we want to be. What online social networks like Facebook do is make these communities or compartments explicit and then shares that with everybody. It therefore just got harder to keep those people apart – great opportunities for innovation in my social graph, but oh bugger, *they* are going to find out about *that*. Now, this is just a prelude to the other thoughts that I’ve included in the presentations I’ve done at Web2Open and barcamplondon3 and the feedback I’ve had is that it’s really useful to see the background. As usual, I’ve done it the wrong way round, should really have written it out, then made a presentation then talked about it, but I really can’t be arsed to do things the way I should. I’m writing this at barcamp by the way, so that might just be a reaction to being in a place where the average person thinks that it’s *very important* to do things *the right way* gaaah! Sites that include comments. He’s been trying to get them to do it and now they’re doing it wrong. This is not official just a bnch of ideas. The main thing is how the audience percieves the (BBCs) content and how that content is seen in the context o f the whole web. bbc is seen as big shiny edifice part of the problem is that comments now get trapped. What are the interactions? – contact, comment, annotation and tagging – producers can look at various analyses. comment – eg The One Show (half-hour magazine prog, a conversation with the audience) but most comments are actually something of a contact. The mechanisms for having comment exist everywhere, what we don’t do is say “I want you to comment so just blog it and tell me where the link is” Cos we’re a big shiny globe in cyberspace and we want to keep you inside. Although this is not the remit of the bbc part of which is to help people use the web more. Probably better to be run somewhere else, maybe as part of PSP. Q: Isn’t this more complicated than it needs to be? Commerce has always been Conversations —> Relationships —-> Transactions but advertising assumes a transaction, and has historically tried to ignore the difficult bit ie relationships. VRM is about how we get to take power over our own commercial information, about making a platform for you to do this, not about owning the data. Adriana says I can’t remember all the things about everything I’ve done, I want lots of it remembered automatically. So collect the data, make some tools for analysis, overlay your social network and preferences. 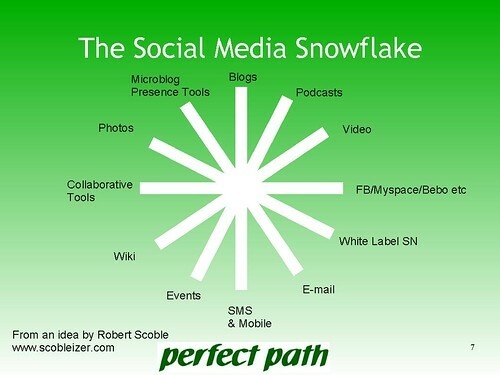 A couple of weeks ago, Robert Scoble blogged and made a couple of videos talking about the combined use of a whole bunch of social media tools and wrapped them up by saying they were a starfish. His point by the way was not only to explain how these tools all help with marketing and sales conversion but also to talk about how Open Social is changing the landscape. When I came to present this to a client in the context of a social media strategy however, I was about to use Darren Barefoot’s excellent graphic version (with added logos!) when it suddenly occurred to me that actually it would be better to talk about it as a snowflake because we’re in the business of making snowballs to roll downhill.